(2 packs) Our all natural Hemp protein powder is a nutrient rich source of plant protein that is easy to digest and allergen-free (no gluten, lactose or soy). Produced without heat or chemicals, our protein provides a non-gmo vegetarian and vegan source of high quality wholesome protein. Raw, natural, whole food made with only one ingredient – hemp! 100% plant based protein. great for vegan/vegetarian diets. 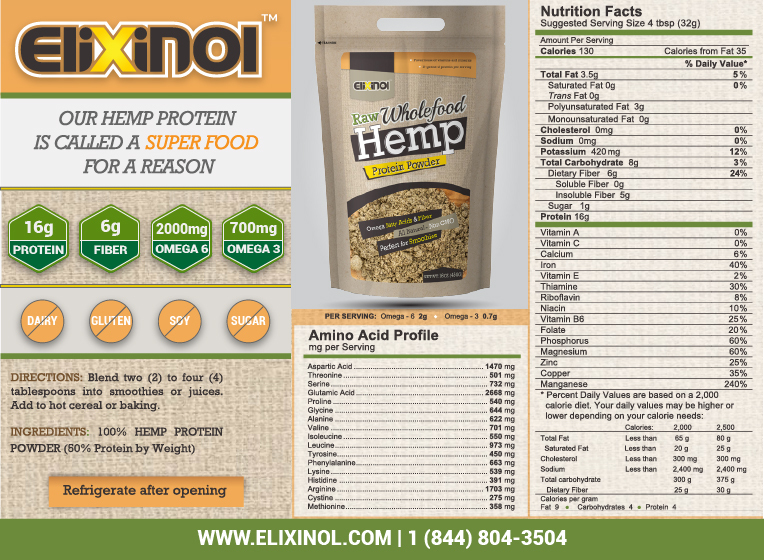 Elixinol Hemp Protein Powder is an incredibly well rounded nutritional food – protein, fiber, omegas and all the essential amino acids. Just take one look at the label! Hemp protein powder can be added to power drinks and smoothies, sprinkled over yogurt, breakfast cereal or used in bread and other recipes for a protein boost.